No complete fitness plan is without a stability ball to train your core giving you support for a better posture while burning fat and easing back pain. Balance ball exercise for all. Whether you are willing to go all out getting a stability ball chair for your job or your workspace at home to exercise while you work or not, there is more to balance balls than meets the eye at first. In terms of exercises balls the stability ball makes the top list of great workout equipment to improve stability straightening out your posture. When your health falls apart, so does the condition of your body. This is especially important to note when it concerns physical fitness. 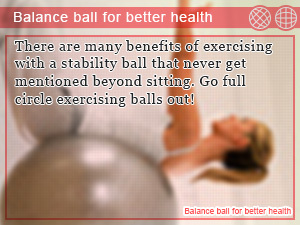 Have you considered taking up exercising with balance balls before? It turns out that this sort of exercise is great for preventing unwanted bodily distortions causing your body to twist and turn out of shape. Are stability balls good for you? 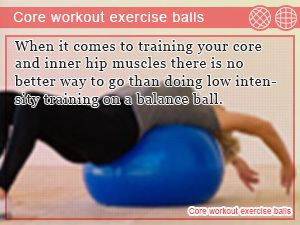 Just by riding your hope on exercise balls getting on top of your body it is possible to correct these distortions before they happen in addition to providing a base to get in shape that is the stability ball. Both affordable and portable you can do it anywhere, whether you are at home or the office. Balance balls have it all. In this daily Slism, we will introduce balance ball exercise using a stability ball going to depth on the benefits you get out doing more than sitting on balance balls such as training the inner muscles in your pelvic area as well as strengthening low back muscles for better posture. The leading cause for back pain comes from sitting with bad posture for elongated periods of time. This poor posture continued over time may cause severe complication in the long run. That is why in order to get by and keep your conditioning on track you are going to need more stability. That's where balance balls come into play. Joining a gym entering in a balance ball sitting class is one of the safest ways to pick up a stability ball for exercise changing the course of your diet and exercise program for the better. What you may lack at home in exercise equipment joining the gym makes up in specialized equipment personalized to your every need. Not only does balance ball exercise make a great postpartum exercise to help mothers get back their bodies, it applies less stress on your body making it easier for people just getting started work up to a respectable level of physical condition moving on to intermediate and even advanced exercises in the long run. When choosing a balance ball out to use at home, it's important to factor in your weight and height into helping your decide which stability ball is right for you. That is to say, tall people should buy balance balls with a larger diameter and heavier set people should buy firmer balls for improved support during exercise. On the road to rehabilitation using balance balls, be sure to check out some reference material to guide you on your way. This may require checking out a DVD or the latest and greatest best balance balls on Blu-ray disk. In addition, you will be please to know how many great resources can be found on the Internet. In terms of the calories you burn working out with a stability ball, this amount may differ depending on the intensity you are exercising at, which poses a problem because there is only so much intensity you can hack when you exercise with stability balls. Always remember safety first. Not getting hurt exercising is more important than how many calories you burn. When typing of the keyboard slightly bending over to see what's on your screen becomes a problem that gives you a stoop, this may be the sight to start doing something to fight against the gravity pulling your body into a little ball. Lift the weight on your shoulders more easily improving core stability for better posture. It is a well-known fact that people only use a minimum set of their muscular skeleton makeup. This is why there is so much concern and even scared stiff people worried about the drastic effects of decreased muscles mass especially in older people that come more naturally, called the sarcopenic obesity. In particular, the area that people seldom touch is known as your inner muscles. Your inner muscles are located deep away from the surface of your skin attaching themselves to your bones and joints. These muscles are thought to be connected to the stability your body possibly able to help relieve pain throughout your body. Doing exercise on a stability ball helps build a sense of balance your need training your iliopsoas muscles, inner muscles located your pelvic area that serve to support your femur, known as your inner hip muscles. Training your inner hip muscles is linked to enhance fat burning that may be your secret to get slim. Balance balls are one of the best ways to train the dorsal muscles located along your lower back and spine as well as your abdominal muscles said to help you naturally slim down your legs. Although it may not seem like much, sitting on a stability ball may work to get you slimmer looking legs after all. People that don't have back pain but would like to train the dorsal muscles of their lower back can carry out this method with relative ease and no need to alter other fitness routines you may be doing at the time. Before doing any exercise always remember to consult with your physician first. Doing this not only alleviates any doubt you may have regarding the safety of your exercise but presents an opportunity to ask your doctor professional advice on which exercises you should do and when. Stability balls are only one ball exercise that you can do to get in shape using the weight on your body with little risk of injuring yourself giving that you are exercising with great form to. However, that doesn't mean that balance balls come without risk. On major cause of injury comes from falling off your stability ball. This happens often when people exercising lose balance either by slipping or fatigue related causes. To avoid this be sure to give yourself enough time to rest between intervals and wipe off your sweat for goodness sake. Another are where people often run into problems is basing too much of their fitness or rehabilitation program on one single exercise. This can be easily avoided by taking up exercises such as aerobic exercise to burn more calories when you need a break from the balance ball. Exercise roundup of the best workout routines for breaking into fitness for burning calories. Browse through and find the exercise that’s right for you. A hula hooping fitness plan to use your hula hoop for exercise to slim down your waist at home, the office, or literally anywhere. All you need is a hula hoop. Just because you own a stability ball chair doesn't mean that you are going to straighten out your posture. Know your balance balls now. There are many benefits of exercising with a stability ball that never get mentioned beyond sitting. Go full circle exercising balls out! When it comes to training your core and inner hip muscles there is no better way to go than doing low intensity training on a balance ball.